It was a dejà vu occurrence for the No. 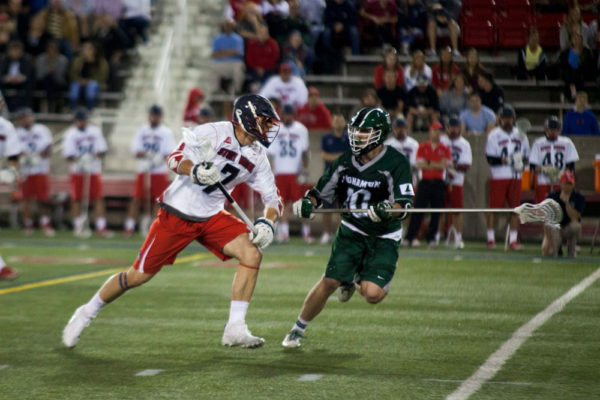 4 seeded Stony Brook men’s lacrosse team Thursday night. The team allowed an eight-goal second quarter stretch by Albany for the second time this season. This time around it cost the Seawolves the semifinal game in the America East Conference Championship race at Casey Stadium. The top-seeded Great Danes set the tone early and never looked back, defeating Stony Brook 19-6. The Great Danes matched the same score they dropped on the Seawolves during the regular season in which they defeated the team 19-11 on April 11. Albany will look to win its fifth championship in six years with the win. The Inside Lacrosse poll ranked the Great Danes as the best scoring offense in the nation, scoring over 15 goals a game. They proved it in the first half, putting on an offensive show going up 12-1 heading into halftime. Albany’s second quarter spark began with senior midfielder John Glancy, who began the 8-0 run that spanned only 5:16. Sophomore midfielder Sean Eccles flipped the ball over to Glancy in the middle of the field and Glancy ripped one into the back of the net from 15 yards out with 6:46 left in the half. Albany’s junior midfielder Kyle McClancy and junior attackman Justin Reh led the offensive push as each player had four goals in the first half. Stony Brook head coach Jim Nagle used three different goalkeepers during the game. Junior goalkeeper Brandon Maciejewski played the entire second half, recording four saves and allowing seven goals. The biggest factor in the game was face-offs. Freshman face-off specialist TD Lerlan won the first 19 face-offs for Albany. Stony Brook did not win its first face-off until the 8:15 mark in the third quarter. The Great Danes also posted 27 shots on goal compared to the Seawolves’ 14. The careers of senior attackman Ryan Bitzer and senior midfielder Alex Corpolongo will come to an end with the loss. Bitzer finishes ninth on Stony Brook’s career-assist list with 62 and Corpolongo finishes ninth on Stony Brook’s all-time scoring list with 95 goals. Bitzer knocked in his final goal as a Seawolf with 8:15 left to go in the third quarter on an assist from freshman attackman Tom Haun. The freshman finished the season with 23 goals, good for second-best on the team. Haun drew two defenders on the left wing and found Bitzer coming around from behind the cage, dumping it in for the Seawolves’ third goal of the game and the last of his collegiate career at the 8:15 mark in the third quarter. The Seawolves are now 4-9 against the Great Danes in the America East playoffs. Stony Brook has dropped four straight postseason games against Albany since they defeated them in the 2012 America East Championship game. With the win, the Great Danes advance to play in the championship game against Binghamton on Saturday, May 6 at 12 p.m. at Casey Stadium.